It’s hard to engage students who are simply taking a class. Like hundreds of educators, Georgann Jouflas was trained to teach entrepreneurship in Steve Blank’s Lean Launchpad methodology. Like hundreds of educators, she struggled to adapt that curriculum from Stanford University and University of Berkeley MBA students to teach her students. Georgann teaches at Colorado Mesa University in Grand Junction, Colorado. The views are spectacular. So are the students! Georgann eventually came to understand that Stanford and Berkeley MBA students are trying to launch actual companies, whereas her students are taking a class. One or two every so often might want to try starting a business. Because of the different motivations and contexts, she struggled to adapt the Lean Launchpad approach to teach her course. Georgann struggled to create meaningful learning experiences for her students. 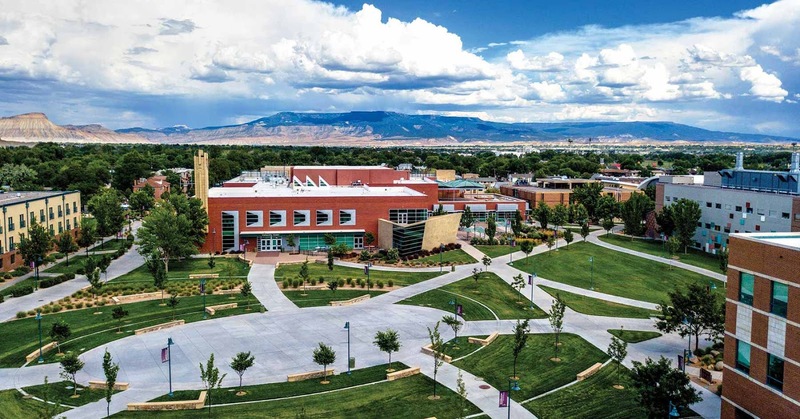 At Colorado Mesa University, like many other campuses around the world, Georgeann is teaching an entrepreneurship course, not an accelerator cohort. She needed a curriculum that was a better fit for students taking an entrepreneurship course. She wanted to teach her students how to discover their passion and how to solve problems, not just work with ideas. Georgann’s students needed to deeply engage with understanding the power of hidden assumptions, and how to prototype. 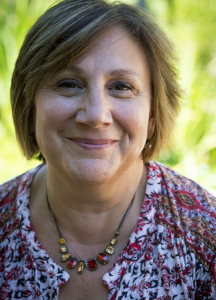 She wanted her students to understand the importance of customer interviewing, but more importantly, she wanted them to learn how to interview customers. She knew gathering information from customers was critical, and that her students weren’t really learning that under her current course structure. Georgann found her students faking validation; they would not get out of the building to interview customers each week because they were not comfortable interviewing people. She felt like a failure because she couldn’t get her students to get out of the building and conduct their interviews. 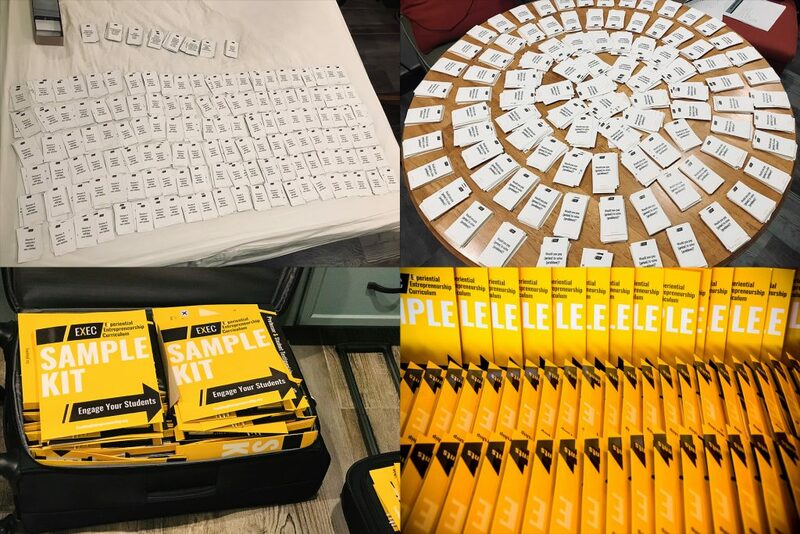 15 weeks of structured plug-n-play experiential modules covering idea generation, problem validation, customer interviewing, prototyping, financial projections, and more! The main value to Georgann is that ExEC coaches students into a comfort zone with interviewing customers so they actually do it, learn from it, and gain confidence. 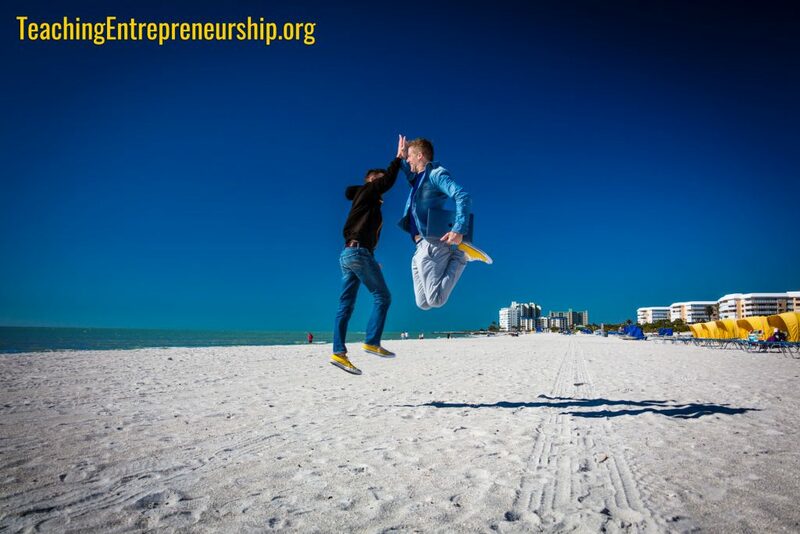 Why Teach with the Experiential Entrepreneurship Curriculum? At the end of each semester using the Lean Launchpad, she was really frustrated with the experience of teaching the course. She didn’t believe her students were learning as much as they could or should, and weren’t very engaged in the learning process. A colleague of hers was sharing her excitement with Georgann about this new way she was teaching her entrepreneurship course. Her colleague was talking about a buzz of activity, about a classroom filled with engagement and excitement, about students deeply learning core entrepreneurial skills. Her colleague shared that she was using ExEC. Georgann got excited about creating this learning environment for her students. Georgann also shared that she enjoys working with the plug-and-play modules, because they are very easy to follow and to use. She feels empowered because she gets plenty of background material and then the applied exercise with each lesson plan. Perhaps more than anything, Georgann reports that she enjoys the experiential nature of the curriculum, because she isn’t left having to think up what exercises to use to engage the students in the learning. Georgann rediscovered the excitement of teaching entrepreneurship. Her students enjoyed learning the skills an entrepreneur uses to build something someone wants. Here is the full interview with Georgann that digs much deeper into her experience searching for a new curriculum and adopting ExEC. request a preview of our ExEC curriculum here. The nerve center of any entrepreneurship course is the syllabus. The syllabus creates a student’s first impression. It sets a tone for the course, and for the relationship between professor and student. A syllabus conveys information about expectations. It is a contract between professor and student. We would love to see your syllabus built in an entrepreneurial way. But we know that’s not always possible. 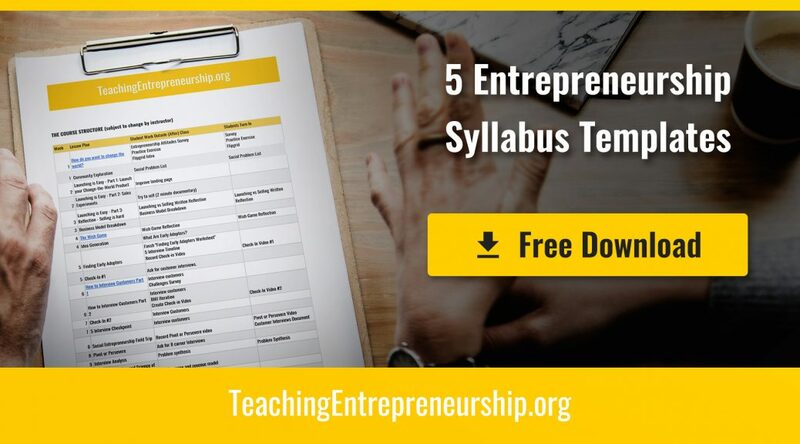 We asked our community of over 4,000 entrepreneurship educators to share their syllabi, and based on the common courses we saw, we developed a few syllabus templates you can use. Each syllabus injects experiential learning into your course from the first day until the last. Your students will be engaged from the first experience in your classroom! Each sample syllabus outlined below focuses on a variety of readings, examples, discussions, and experiential exercises students can use to explore and apply the principles of entrepreneurship in a variety of courses. Creativity is one foundation of successful businesses. Whether in the for-profit, not-for-profit, or public sector, organizations need employees who are creative thinkers and can thrive in an organizational climate that fosters innovation. Entrepreneurship can be considered a process of economic or social value creation, rather than the single event of opening a business. This course focuses on opportunity recognition, assembly of the financial and human resources needed to develop the idea, and launching the new venture. Creating a venture is one manifestation of entrepreneurship. Students in this course will have the opportunity to develop an entrepreneurial toolkit that allows them to successfully innovate in whatever professional life they choose to lead. This course focuses on problem identification and solving, customer interviewing, and prototyping. Social entrepreneurship can be explained as the practice of identifying, starting and growing successful mission-driven for-profit and nonprofit ventures. 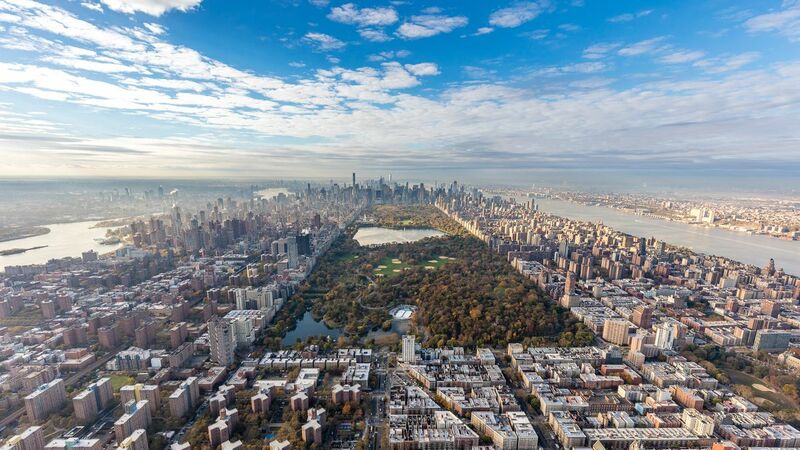 These organizations strive to advance social change through developing innovative solutions to problems that plague communities, cities, countries, and systems. Through experiential exercises, guest speakers, and classroom dialogue, students will learn to think and act opportunistically with a socially-conscious business mindset. Topics will include problem identification, customer interviewing, prototyping, financial projections, business modeling, and storytelling. In this experiential, hands-on course, students will learn the customer-development approach to building products and services. More specifically, students will learn how to systematically identify and test assumptions to make decisions to pivot, proceed, or restart based on customer insights and evidence gathered. In upcoming posts, we talk about our evolving experiential curriculum, how to teach students about financial projections, and how to enable your students to tell a story people will remember! Invalid assumptions are the root of most business failures. It’s important our students understand how easy it is for everyone, including them, to make them. In just 15 minutes, this interactive exercise will help your students understand why they need to validate their business assumptions. We introduced this exercise to our community here as part of a larger series of exercises. 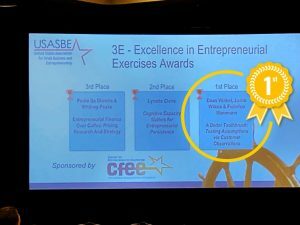 You all helped us tweak the exercise into a format that won the Excellence in Entrepreneurial Exercises Competition at USASBE 2019! Given the success of this exercise, we wanted to provide an overview so you know how and why you might engage your students with this exercise. For more details on this exercise, check out this lesson plan. Form teams of 3 or 4 students. Give each team an adult toothbrush. The color scheme element is really a red herring. The colors they choose are irrelevant. We include the color scheme requirement to ensure students are not solely focused on the dimensions element. The dimensions are where students will unearth hidden assumptions, and create an ineffective product based on those hidden assumptions. Hidden assumptions will likely cause students to design a toothbrush with the wrong dimensions for children. They will assume a smaller hand needs a smaller toothbrush. 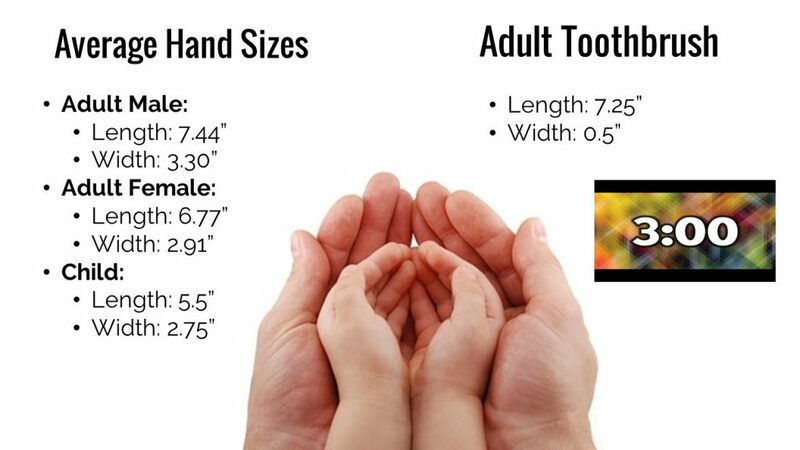 Display the slide below that contains hand size data. 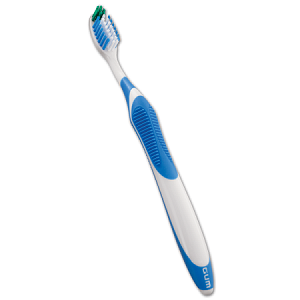 Give students 3 minutes to design a child’s toothbrush. After 3 minutes, ask teams whether their child’s toothbrush was larger or smaller than an adult’s. Most teams will end up making a smaller toothbrush. This is a very natural and logical assumption based on the hand size data we presented them. It is the assumption very experienced product designers at toothbrush manufacturers made, so your students are in good company! Reflect on what hidden assumptions they made, and why they made them. Point out that many toothbrush manufacturers made the same invalid assumptions many of them made in terms of a smaller hand needs a smaller toothbrush. Discuss how students could test their assumptions to determine their validity. Steer them toward observing customers using a product or service, and toward prototyping the product or service. If you want to introduce your students to a curriculum of these kind of award-winning experiential exercises, request a preview of our ExEC curriculum here. We’ve created a detailed lesson plan for the “Toothbrush Design Challenge” exercise to walk you, and your students through the process, step-by-step. In upcoming posts, we talk about our evolving experiential curriculum, why educators are adopting this curriculum, and how to enable your students to better identify opportunities! As I was reimagining my MBA entrepreneurship course, I kept these thoughts top-of-mind. I wanted to set an example with my class – to create an experience that solved my customers’ problem. My customers’ problem? Disengaged learning. I stumbled across Rebeca Hwang and her Wish Game idea. My students were in for an experience unlike anything they’d ever had in a classroom. Because the experience is so different from their typical learning environment, it has been painful at time to watch them struggle to grasp the concept of learning entrepreneurship through granting each other’s wishes. During these wishes, students have struggled with thinking big, with practicing entrepreneurial skills of ideating, customer interviewing, prototyping, and mobilizing resources. They deliver wishes, but I push them to keep aiming higher, dreaming bigger, failing faster. As with most skills, with practice, they are getting better not just at execution, but at creating experiences. The first two showed my students’ execution capability. One Kuwaiti student is about 7 months pregnant, with her 4th child, and wanted an American baby shower. In her culture, I discovered, they do not have a celebration prior to the baby’s arrival. 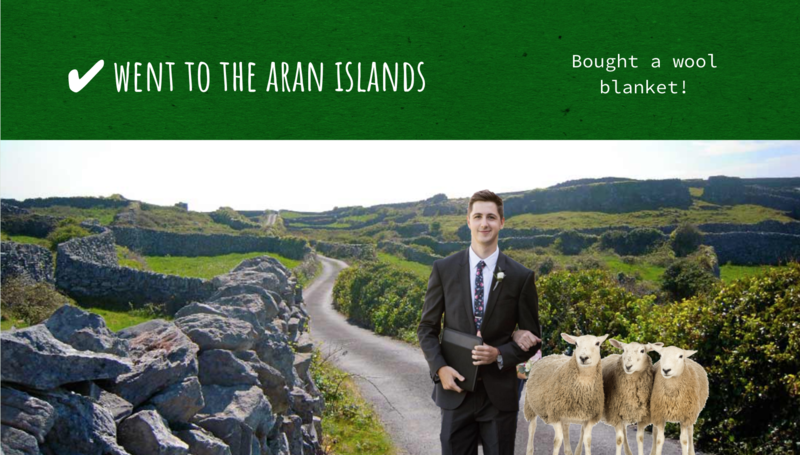 Given she’s in America, and I gave permission to dream big, this is her dream. Her fellow students attacked the wish with their now typical gusto. She is a HUGE fan of Ellen Degeneres, so wants to attend the Ellen Show, play a game on the show and win a prize. She is from Tanzania and wants to visit Disneyland before returning home. Students in the group delivering this wish again nailed the customer interviewing, understanding her motivation for these particular wishes. I’ve encouraged the students to drill into the emotions driving the desire for a particular wish. Because if they cannot deliver the specifics of a wish, they can develop a plan b, or c, or d, or q. They can prototype, like entrepreneurs. This group contacted Ellen with our story as much as they could over the week – multiple form submissions, emails, and calls every day from everyone in class and from lots of other students and friends. They also worked on getting Disneyland tickets, airplane tickets, and hotel reservations donated. None of this happened, so their plan b was to buy a $300 Disney gift card, recreate the Ellen Show in the classroom (complete with a dude in a wig playing Ellen), and played Blindfolded Musical Chairs. Of course they fixed the game so the grantee won, and her prize was the gift card. Both groups felt so energized after these wishes. They nailed the interviewing. They felt they delivered a good idea, but also acknowledged they weren’t taking a risk with their ideas yet. I push, and push, and push some more to get them beyond their fear and lead them into the uncertainty of big ideas. We talked about how far they had come from the first wishes, and how far they had to go to deliver true awesome. I often forget what it is like to be ~20 years old. Stumbling through an uncertain present and staring into an uncertain future. Wanting to show confidence, but not feeling confident. It’s my job to build that confidence, by guiding them into uncertainty, supporting them while they struggle with it, and giving them the tools to reflect on it powerfully. 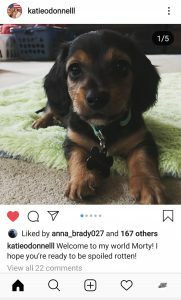 One of the wish grantees wanted a male, black & tan miniature Dachshund puppy. Her other wishes were to pay off her student debt, or to have a year’s rent in a nice apartment in downtown Cleveland. The group went with the puppy. As with the baby shower, this wish is really all about execution. 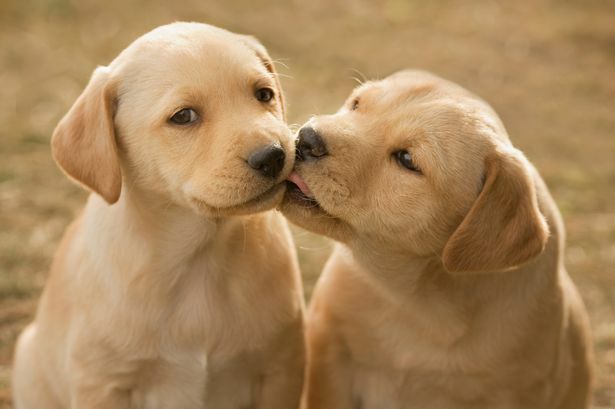 The group got right to work to find a puppy – apparently this isn’t the most common kind of puppy to find. But they did it! One member of the group negotiated the price down to $300 – they are finally figuring out they can mobilize their financial resources to make wishes come true. 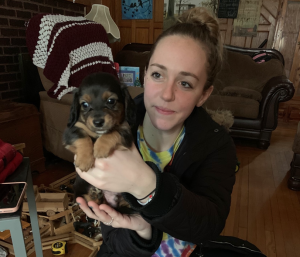 The grantee met her puppy (she named him Morty) but she won’t be able to take him home for a couple weeks, until he is at least 8 weeks old. The other wish in this class was the grantee wants to be driven in a Rolls Royce Phantom. 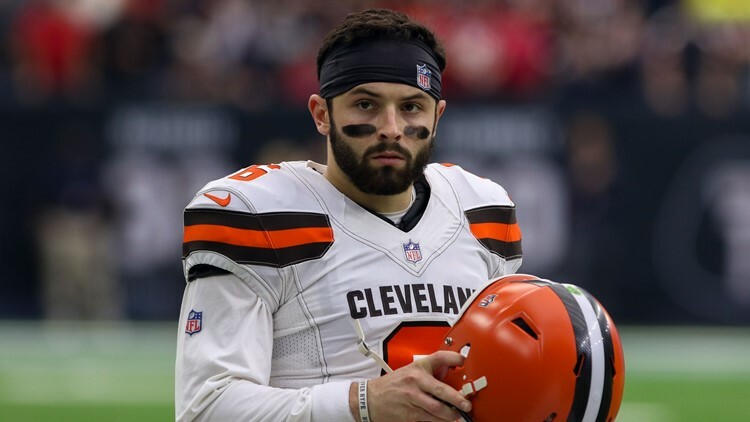 His other wishes were to meet “the” Michael Jordan (I particularly liked how he intentionally included “the” so nobody could play games with just any Michael Jordan) and to call an offensive play for the Cleveland Browns. 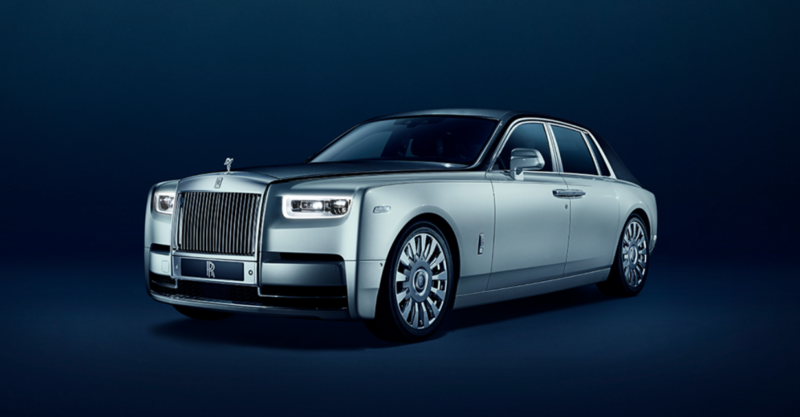 The group decided to go with the Phantom. I hadn’t heard of this car, but after looking at pictures and videos, I understood where his wish came from. The group delivering this wish ignited their network to find Cleveland folks who owned this car. Unfortunately, they did not find any during the week. They did, however, realize they knew someone who worked at the local Rolls Royce dealership, so when the weather improves, they will work to get the grantee a test drive. They did buy the grantee tickets to the auto show in Cleveland over the weekend, where he can go see this car. One will challenge the group to actually deliver it, and that other will challenge the group to enhance the wish beyond the obvious to deliver a memorable experience. PS – here is an updated picture of Morty at home with Katie! We will continue to run blog posts highlighting Doan’s journey throughout his semester-long Wish Game Course this Spring. Students don’t like customer interviews, but they do like games! So we combined the two to make customer interviews more fun and approachable. When you run this exercise, your students will be fully immersed in the lesson as they hurriedly sort cards into different piles and compete with one another using their phones to see who can correctly answer the most questions, the fastest. Big hit tonight! Lots of competition! Really got through on true purpose of problem discovery and what questions to ask / not ask. They are in much better shape going into interviews than my prior students. 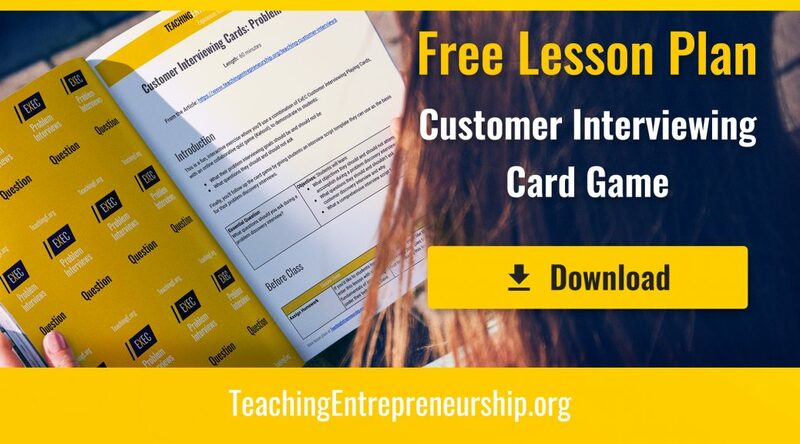 Give the Customer Interview Cards lesson plan a shot. It’ll add a boost of energy to your course and your students will love it. To set students up for success, they need to do a little prework. Have your students watch this video on what to ask during customer interviews. 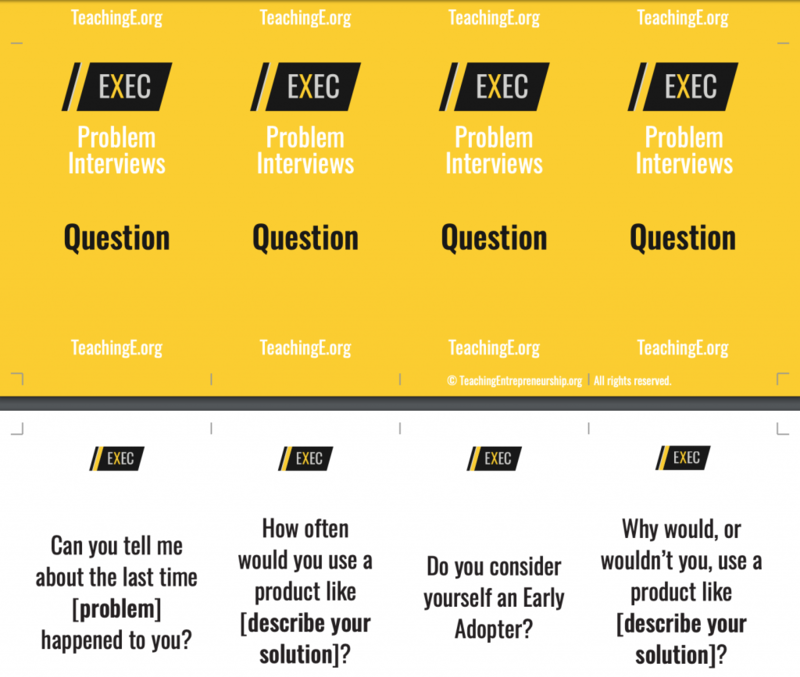 Print and cut one set of Customer Discovery Interview Cards for every two students. 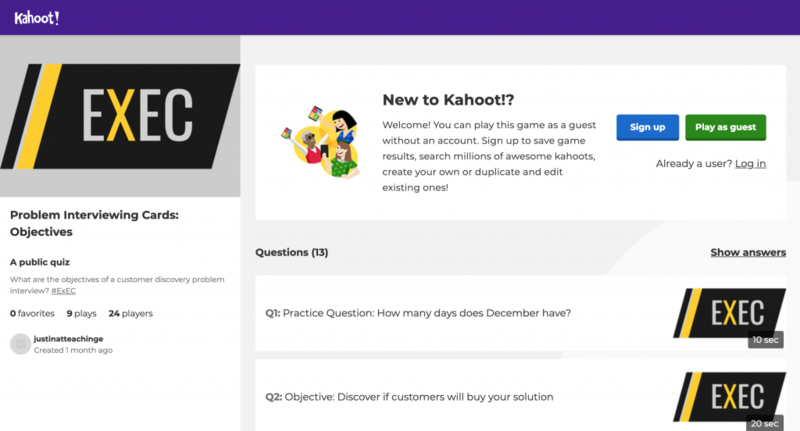 Get familiar with Kahoot; watch this Kahoot demo video, and review the Kahoot questions here. Review the answers to the Interview and the Objective cards here and print a copy for your reference. Print out one copy of the final interviewing script for each student. Prior to this class session, familiarize your students with the purpose and he value of customer interviewing. 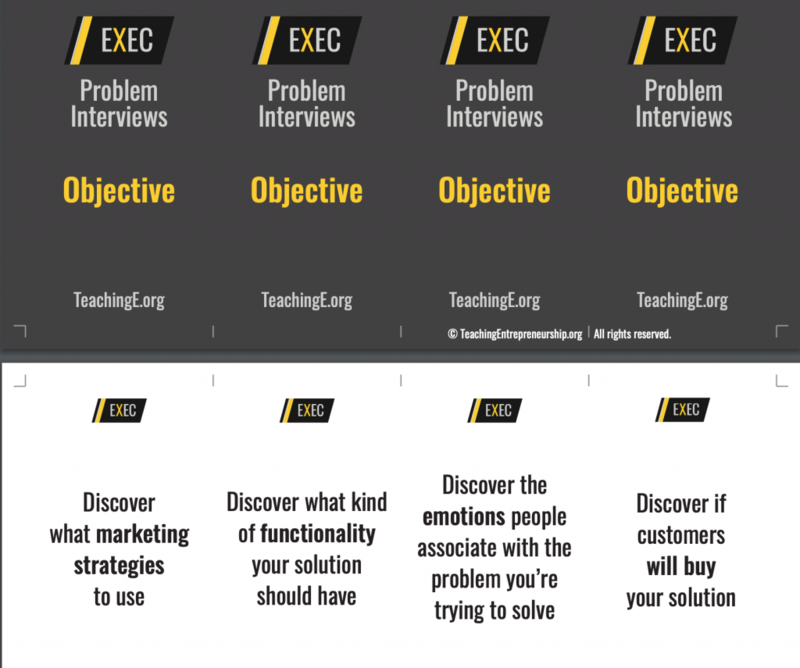 Pair students up, give each pair a set of the gray “Problem Interviews Objective” cards, and give them a few minutes to find the six objectives they should achieve during customer discovery interviews from the 12 objective cards. Find detailed instructions for setting up Kahoot in the full lesson plan. Project Kahoot on the screen and read the first objective question aloud. Students use their phones to indicate if it’s a good or bad objective for a customer discovery interview based on how they categorized their cards. After all students record their answer, you have an opportunity to discuss why a particular objective is good or bad for a customer discovery interview. Students will generally have different opinions for each of the 12 objectives. This warm-up game is an opportunity for rich dialogue to help students deeply understand the purpose of customer interviews. Progress through all 12 objectives, discussing each one as you go. Kahoot displays a live scoreboard – congratulate the winner after going through 12 objectives, but let everyone know this was just a warm-up game. The real game is next – to determine what are good and bad interviewing questions. Students now know what their customer interviewing objectives should be. Hand out the 24 Customer Interviewing Question cards, and students should identify which 9 questions are ideal to ask. Now start the Questions Kahoot game and have students join. Lead students through the same process you did with the Objectives Kahoot. Students record their answer in Kahoot about what are good and bad Problem Interview questions. This is another powerful opportunity to discuss why a particular question is good or bad for a customer discovery interview. Kahoot displays a live scoreboard – congratulate the winner after going through all the questions. Crown the Customer Interviewing Champions! Reward them with some prize. Make a big deal of this to let students know how important customer interviewing is to entrepreneurs. Your students now have a strong understanding of customer problem interviewing objectives and good questions to ask. It is time to give them an interview template they can use to connects all of the dots. 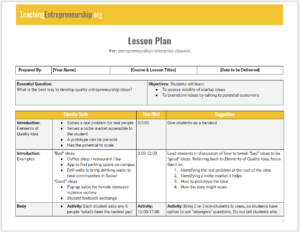 If you use this exercise as a part of the Experiential Entrepreneurship Curriculum (ExEC), we provide an interview template for your students to use. Otherwise, you can create your own. After playing the warm-up and the real game, students understand why they should ask the “good” questions. Students also understand why they should not ask many of the questions they would intuitively think to ask. Now is your chance to answer any questions or fears your students have before sending them out into the field to interview actual customers! But have no fear, your students are well-prepared with solid questions that will help guide their ideation. If you want to help your students deeply understand why and how to interview customers, get the full lesson plan by clicking below! We’ve created a detailed “Customer Interviewing Cards” lesson plan. This exercise walks you, and your students, through the process, step-by-step. In an upcoming post, we will share a companion exercise to the “60 Minute MVP” exercise. This will help students understand why it is critical to engage customers prior to launching! Entrepreneurship students often struggle getting their first customers interviews because they lack a functional definition of Early Adopters. 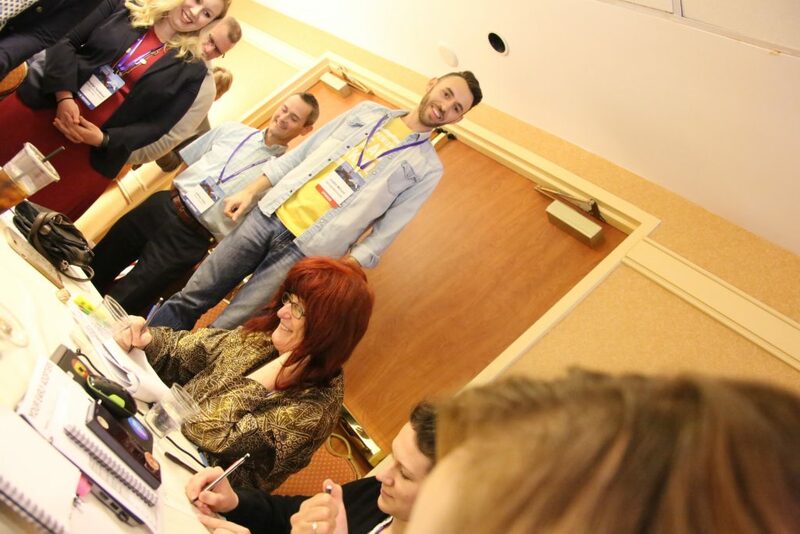 This exercise uses mechanical pencils, and a 10-minute competition between students, to introduce Early Adopters in a way that not only contrasts them with Early Majority and Late Majority customers, but also demonstrates where and how to find a business model’s Early Adopters. We are very proud that this exercise was a finalist in the prestigious USASBE 3E Competition, which recognizes the best experiential entrepreneurship exercises at the USASBE 2019 Conference! Who is the target for our customer interviews? How and where do we find people for our customer interviews? Early Adopters: the first people willing to try your product or service. There are a few of these people, but they are vitally important to the success of your business. These people are so hungry for a solution to their problem they’re willing to try anything…including an unproven product like yours. Early Majority: this is the larger influx of people who will make your product a success. These people have a problem you can solve, but they’re not desperate for a solution like the Early Adopters. They’ll need some convincing (by an Early Adopter) before they’re willing to try your product. Late Majority: just behind the Early Majority, the next wave of customers will sustain your business over time.These people have a problem, but they don’t know it. They need to be educated that they have a problem before they’ll become your customer. Laggards: this group is generally not interested in your offering, or may join the party very, very late in the game. Typically they don’t even have a problem, so they’ll only reluctantly become your customer. Next it’s good to walk through the worksheet below, so students better understand how to identify and find early adopters. Confirm behaviors offered by students are related to the hypothesized problem. For example, “Goes to the pound to look for their dog” is more likely the behavior of someone who has already lost their dog, not someone who is “worried about losing it” in the future. To validate there are Early Adopters for their problems, students will actually talk to people trying to solve the problem. In other words, they’ll need to actually find these people and ask them about their problems. In order to do that, they will need to find people already trying to solve their hypothesized problem. To find people trying to solve the their hypothesized problem, your students will need to come up with Externally Observable Behaviors for their Early Adopters. Externally Observable Behaviors are similar to the Early Adopter behaviors they’ve already written up. The difference being that an Early Adopter Behavior could be an action that someone takes alone at home that your students would never know about, so they won’t be able to find them taking that action to talk to them. Externally Observable Behaviors on the other hand are actions people take that your students, personally, can observe so they’ll know where to find those people to talk to them. Note: You will need four volunteers for this exercise. Have the four students come to the front of the room where you have a desk setup for each of them. On each desk, place a piece of paper, and one of the mechanical pencils you prepared before class. Note: Place the “Early Adopter” pencil in one of the middle seats that everyone can easily observe. Ask your volunteers to sit down, and ask the rest of the class to stand up and join you around the four volunteers. To solve this problem, tell your students you’ve created a new, more reliable, high capacity pencil that holds 4x as much lead as a normal mechanical pencil. Give them 30 seconds to figure out a strategy to determine which of the four is the Early Adopter. Ask several of the groups to offer their strategies. Then ask the standing students, can you tell which one is the early adopter right now? Answer: No, because you’re observing your customers sitting there, you’re not observing them in a situation where they would encounter or attempt to fix the hypothesized problem. Ask your standing students, how might we be able to tell which one is the Early Adopter? Answer: By asking them to write something, particularly something in a high stress situation. At this point all four of your volunteers should start feverishly writing, or at least trying to. The early adopter student should start behaving in a way that is clear their pencil is malfunctioning. This is exactly what we want. In fact, at one point the student may even extract the led, ditch the pencil body entirely, and try and complete the task while pinching the led between his/her fingers. If the “Early Adopter” student asks for a new pencil, or complains theirs is broken, encourage them to try and fix the problem and complete the task. No matter what happens, even if the Early Adopter student doesn’t get all 10 words written, consider giving them extra credit for participating. You can add extra layers of sophistication to this exercise by trying to “sell” a solution to the Early Adopter’s problem by offering a working pencil in exchange for some percentage of their reward. For example, if you’re offering them 10 extra credit points, you can “sell” them a working pencil in exchange for one or two fewer extra credit points. With your class still standing around the volunteer students, ask them if they wanted to talk to someone about the emotions related to malfunctioning mechanical pencils which student should they talk to? Answer: The “Early Adopter” student. The one who just experienced and tried to fix the problem. Tell your class that there are early adopters all around us all the time; we just need to observe them in the contexts where they are experiencing, and trying to fix, problems. Now ask your class, what do they think would happen if you had built your new pencil solution and tried to sell it to one of the other three students who weren’t Early Adopters? Answer: None of them would have bought your pencil. We don’t buy products that don’t resolve an emotional need for us. Use this example to emphasize why it’s so important to identify the right customers to target. If you can’t find the people who are trying to fix a hypothesized problem, you can’t find people to buy a solution for it. Now ask your students what would happen if you sold your fancy pencil solution to the early adopter, and the next time one of the other three people’s pencils broke, our early adopter let them borrow their new fancy pencil solution? Answer: The person with the broken pencil would now be experiencing the problem, and may be emotionally motivated to buy a solution to it, likely becoming your customer. Emphasize to your students that this is how successful companies become successful. They don’t start by trying to sell fancy pencils to everyone. Instead, they sell to a small group of people experiencing an intense emotion – their Early Adopters. Then the company’s early adopters help the company sell their solution to members of the Early Majority, Late Majority, and the Laggards through referrals and social proof. Ask your students, what if after several attempts of observing students using mechanical pencils, you never saw someone trying to solve problems with their pencils running out of led? Answer: The time might not be right for a new “high capacity mechanical pencil.” Maybe pencils hold enough led as it is. Maybe students have other problems that are more pressing and deserve more attention than a high capacity pencil. This might not be the best business to build at this time – and it’s better to find that out before designing and manufacturing the new pencil, than it is after. Drive home for students that just because you fail to find people trying to solve a problem doesn’t mean you fail. In fact, failing to find people trying to solve a problem is a faster way to succeed, because you won’t waste time trying to solve a problem that no one cares about. Instead, you can “pivot” to solving a more pressing problem, one that people will pay to solve. 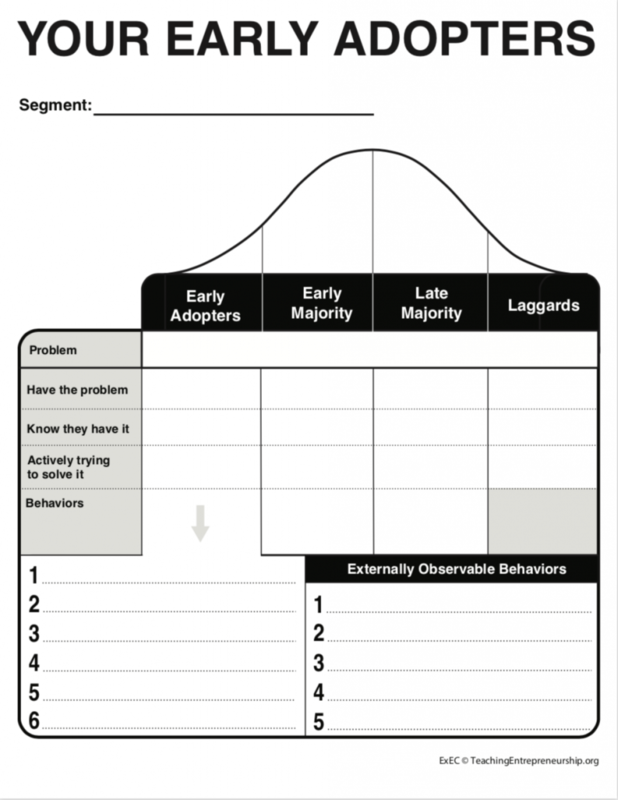 Have your students return to their desks and continue with the Your Early Adopters worksheet. Ask them where you might find people actively seeking a solution to their fear of losing their dog. What are the externally observable behaviors for your early adopters? Note for your students how every externally observable behavior has a location where you might be able to find these early adopters. If you want to help your students find the right people to interview, use an exercise that was a finalist in the prestigious USASBE 3E Competition by clicking below! 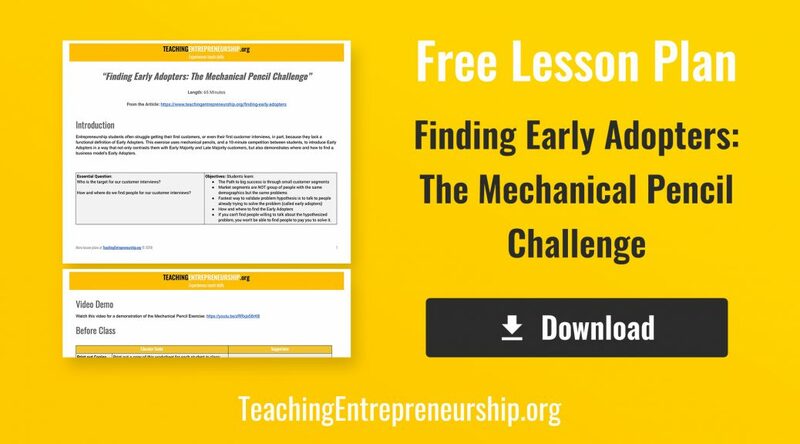 We’ve created a detailed “Finding Early Adopters: The Mechanical Pencil Challenge” lesson plan. This exercise walks you, and your students, through the process, step-by-step. In my MBA course, I am running the Wish Game all semester, based on an exercise I heard about from Rebeca Hwang. Students wrote down 3 big, specific wishes on the first day, such as being able to meet a celebrity, or visiting a certain place. I choose two people to be the wish grantees each week. The rest of the class works all week to deliver those wishes at the beginning of the next class session. This exercise is about hyper-collaboration, so all students benefit by working together under considerable constraints. 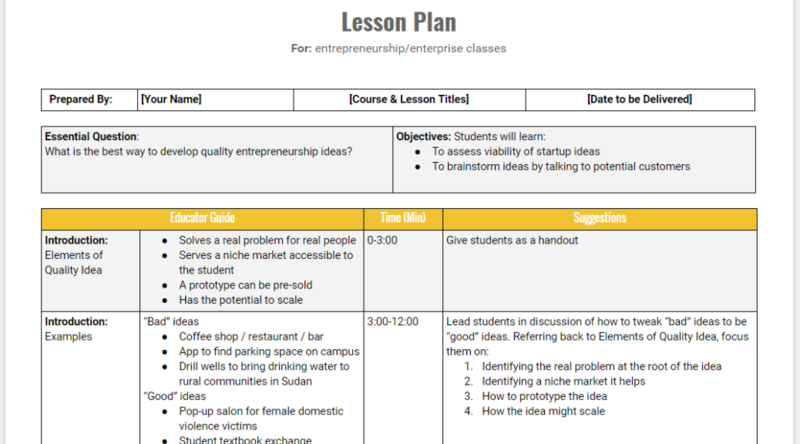 Student learn entrepreneurial skills like ideation, customer interviewing, prototyping, selling, and mobilizing resources through iteratively practicing them. My students didn’t do a very good job with their first wish, which was a test one for my son (to see the Mona Lisa). When brainstorming ideas, they began to think creatively, to stretch their boundaries of what was possible. But when it came time to deliver the wish, it was disappointingly simple, non-engaging, and awkward. From observing groups in class, each group did a much better job of interviewing the wish grantee this time. They asked deep questions about why that particular wish, about the specific sights, sounds, smells, emotions, memories, etc. 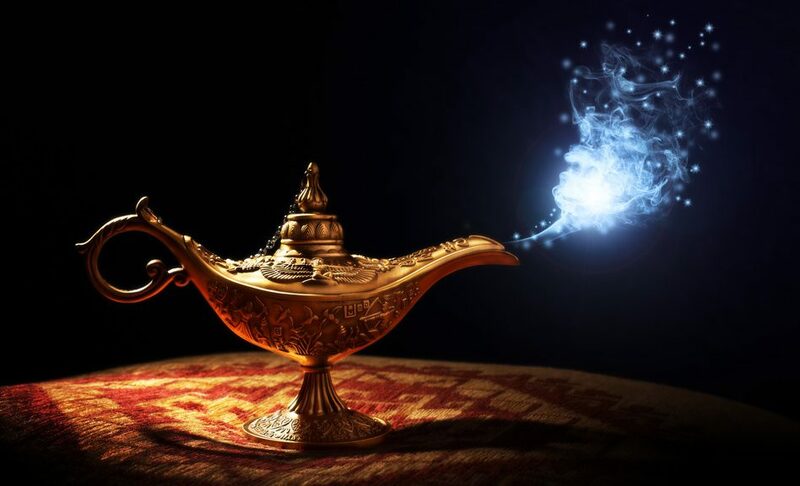 surrounding the desire for that particular wish. I could see the energy and the excitement in the students as they started to grasp how powerful this experience could be, if they gave themsevles to it! 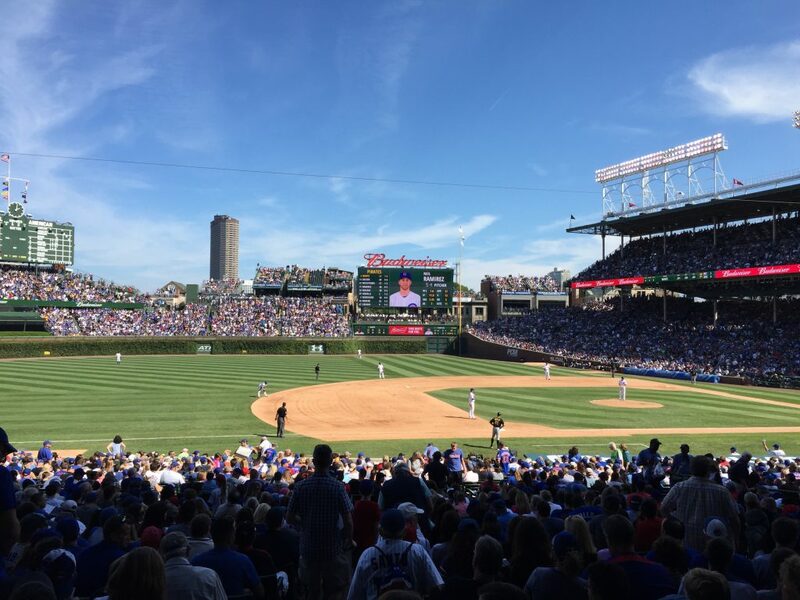 For the wish to pitch in a Cubs game, the group created a player in the MLB The Show 18 video game, and plugged in a Playstation to the classroom screens. The grantee had requested walk-up music (country music, unfortunately! ), but due to some technical glitches the group wasn’t able to play it exactly when he entered the room. The grantee was wearing his Cubs jersey, had steamed hot dogs with ketchup and tomato waiting for him, and pitched an inning as himself on the Playstation. 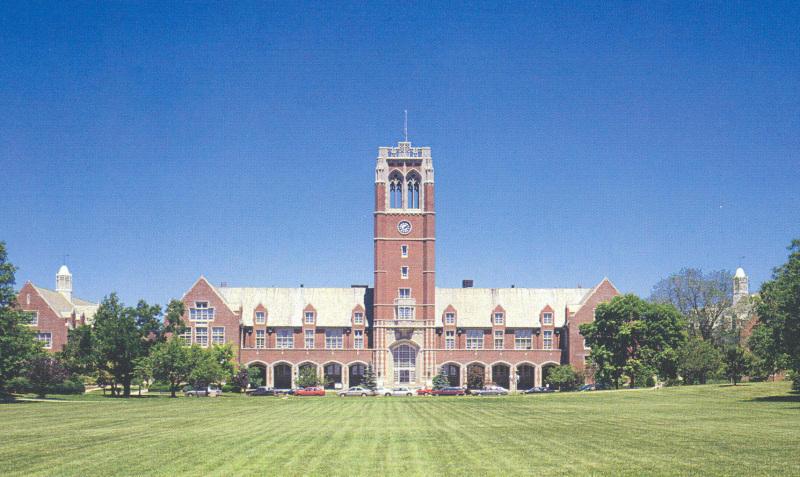 For the second wish, repelling down the JCU clock tower, the group right away asked the JCU President for permission to either repel down the clock tower, or to at least take the grantee to the top of the clock tower. Both options were denied by the university’s Director of Regulatory Affairs and Risk Management. The group apparently struggled mightily after this point with how to deliver the wish if they could not get him into the clock tower, so they defaulted to purchasing him a John Carroll University flag and a framed picture of the clock tower. I could tell both groups felt a bit defeated, particularly the clock tower groups. I encouraged them, and gave them permission, to not hold themselves back. They needed a pep talk, and I delivered. I understand it is really difficult to think, within an academic course, in such a way to deliver amazing experiences. Students reminded each other that they were letting each other down, they shared that they knew they could dream bigger, and could put more effort into execution. The class brainstormed some ideas for them to allow themselves to share crazy ideas. Many students mentioned they didn’t want to seem too crazy, or sound stupid, or set the group up for failure. As one student opened up and was vulnerable in debriefing, others supported him or her, noting that it was good to share and that it helped them all succeed. I left that class feeling disappointed, but also optimistic that they were catching on. This experience is about letting go of assumptions and safety, and giving themselves permission to practice critical skills that will help them succeed in their future. I think they are starting to understand that. My hope was for the groups to continue to grow their confidence to stretch and deliver a richer, more creative experience each week. What I discovered this week was that they still, basically, hit the easy button. I can’t say I blame them – who knows what I would be comfortable doing had my MBA professor thrown this curveball course at me. I realized I have my work cut out for me to push them off the cliff so they can learn to soar. For the make homemade wine wish, the easy button was to purchase the student a kit and directions to actually make wine at home. A few members of the group explained what everything was, where they got it, and their thought process behind the wish delivery. In the wish grantee’s reflection, I learned that his family made wine for many generations, but stopped recently. He wanted to learn more about making wine so his family could make wine together. 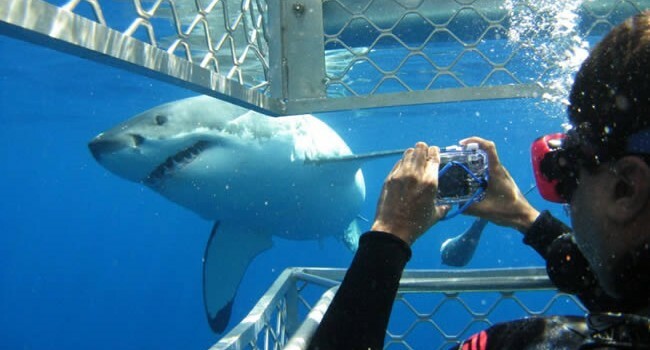 What a fantastic experience that would be! I asked him for feedback after he received his wish. He said all the requisite pleasantries, thanked the group for the thoughtfulness, talked about how excited he was to try it out. But I knew from his reflection that he was excited to smash grapes and really dig into it. I have a feeling he was a little disappointed. I know I was; my students are stuck at easy. Purchasing the supplies to deliver a surface-level wish is easy. Creating an emotional experience within a wish delivery is really, really, really hard. The second wish this week was the student wanted to own a bottle of Pappy van Winkle 23 Year bourbon from the Buffalo Trace Distillery. This group could not deliver the wish on Tuesday, because they did not get a shipment of some things they needed (they and I blamed the Polar Vortex!) so they will deliver this wish the following week. In reading their reflections, I discovered they first investigated actually purchasing this bottle of bourbon. They quickly realized it was far too expensive for their budget (NOTE: each student contributes $10 each week and I contribute $50 each week, and what isn’t spent rolls over. At this point, there is nearly $700 as teams have spent very little). The next option they investigated was very interesting. Apparently, someone suggested they purchase an empty bottle, fill it with cheap bourbon, and seal the bottle. A long discussion of ethics ensued, and the group eventually decided they would do the right thing. I think what they ended up doing was to purchase a few empty bottles of various bourbons the student mentioned he wanted to own, and then purchase him a gift card to a local bar for a few glasses of the particular bourbon he wants. Again, they hit the easy button. They purchased empty bottles, and called around to find a bar that served this particular bourbon. We talked again about ideas for creating more value for the wish grantees. I encourage students to put themselves in the grantees shoes. I want them to imagine the excitement as the anticipation builds, not knowing exactly what the wish will look and feel like. And then I ask them to imagine the feeling when it doesn’t live up to expectations, let alone WOW! them. The looks and the nods tell me they hear what I’m saying, and they understand why I am pushing them. But I wonder if they really get the opportunity? Again, I urge them to think big, to not keep their visions limited to the classroom space. The students keep thinking that they must deliver the wish in the classroom, but I remind them they can deliver it somewhere else, they just need to capture pictures or videos to share with everyone else because the entire class can’t go. We don’t talk about the bottle of bourbon wish because he doesn’t know what is in store. 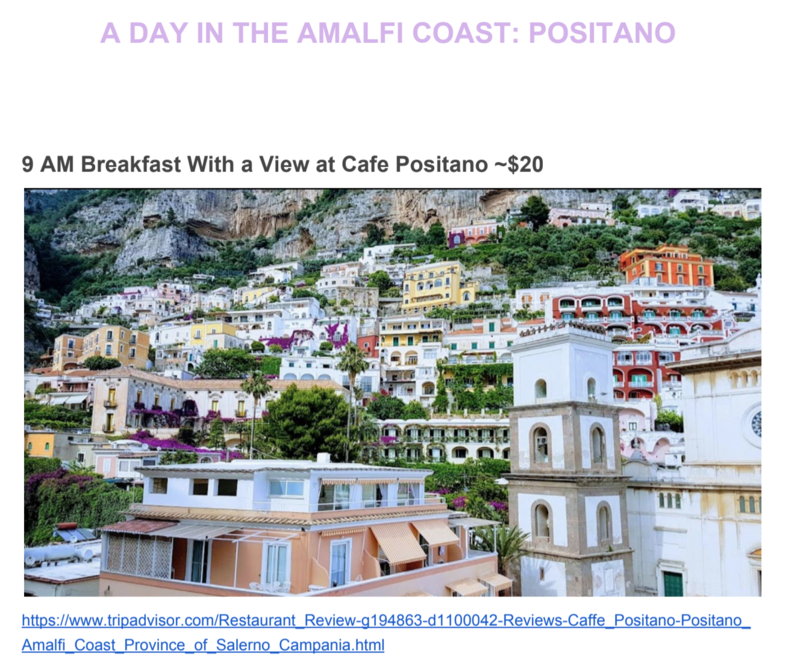 But we brainstorm ways to push the proverbial envelope with the wine-making wish. 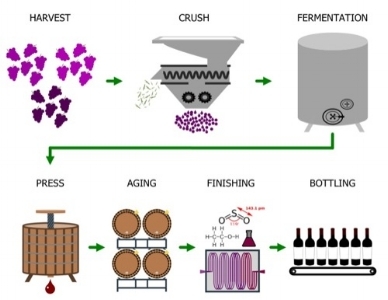 I explain they could have had the student who wanted to make wine smashing grapes in a barrel. Or they could have sent him to a vineyard, or at least called people who run vineyards to get ideas and possibly collaborate. I hope they can go big. As I observed the groups interviewing, they again asked great questions of the grantee, to understand why this wish was so important, and what aspects were most important to focus on. The group working on the puppies quickly started calling kennels and shelters, and I believe even found an Uber-for-dogs kind of service that would deliver dogs. Their ideation and quick action is promising. The group delivering the Greece wish seemed to focus on creating the Greece vibe in the classroom. I heard them talking about food, about renting furniture, about scents, about sand and sun. 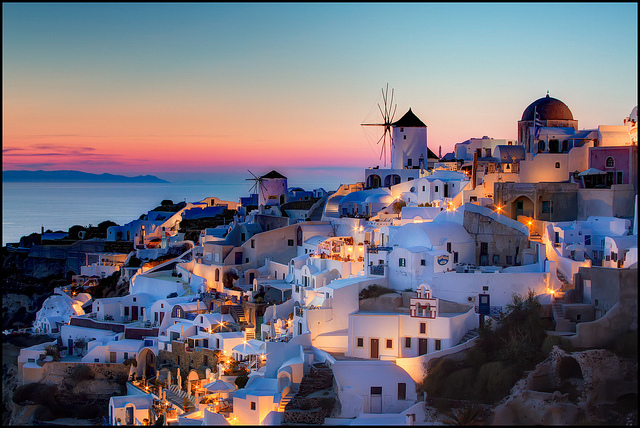 I’m eager to see if they actually transform the classroom into a Greek scene (particularly Santorini, which the grantee specifically mentioned). What I am asking my students to do is something very new and scary for them. I want them to learn in an innovative way. Different is scary, I get that, so I do everything I can to give them the space and safety to try and to fail, to learn and to push further next time. They are still dipping their toes in the water. I hope soon they will decide to jump into the deep end, because I know they can swim. And even if they can’t, I have plenty of life preservers. I invite my students to work on a side hustle during the semester. I told them is The Wish Game is like their job, their 9-to-5 gig. They have to be there every day, it’s what pays the bills. But like an entrepreneur, they can also work on the side on an idea they want to start and grow. A few students connect with me outside class asking for feedback and guidance on their side hustle. I see many of them working on something, but similar to a real scenario, they don’t spend much time on it because life takes over and this gets pushed aside. We debrief each week what some are doing, what they are learning, they ask me questions about various assumptions and curiosities they have around starting a business. I give my students the tools through our learning management system and guide any of them who want guidance through the journey of turning their ideas into reality. This is an opportunity for them to engage or not, to make choices about how they spend their time and resources. 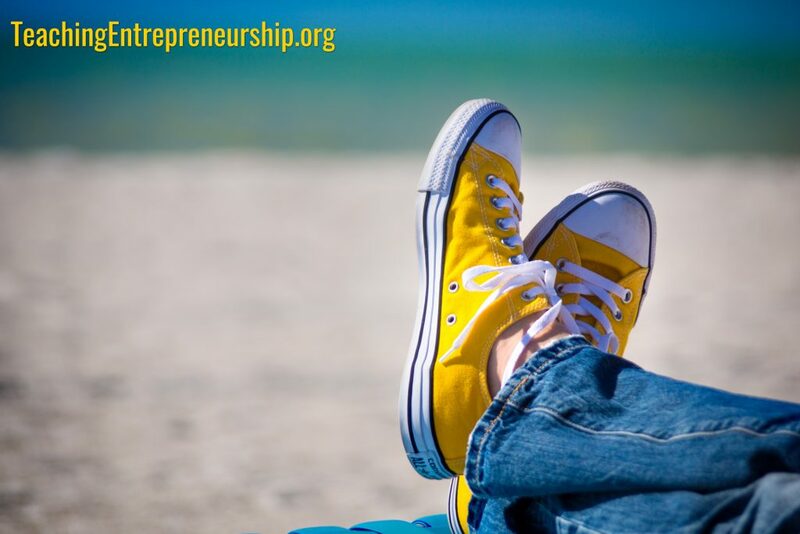 Much like an entrepreneur must decide how to spend her time – with family or building a business – and his resources – on a vacation or building a business. 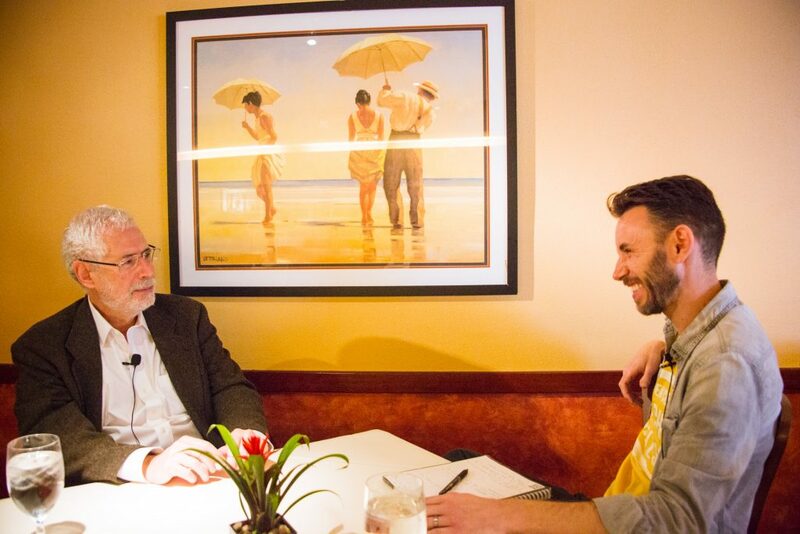 As we highlighted previously, customer interviewing is a critical aspect of entrepreneurship. Whether starting a business, or working within a business to develop new products, understanding the experience of potential customers is necessary to deliver capture value in the marketplace. Students need to practice customer interviewing in a variety of contexts. This helps them hone their skills, but also helps them realize the variety of situations where they can apply this skill in their career path. The following exercise is an adaptation of the “Retooling Products to Reach New Markets: The Lindt Candy Dilemma” exercise Dr. Kimberly Eddleston at Northeastern University developed and shared here. We adapted it slightly to focus more on the customer interviewing opportunity. Pass out Lindt Lindor Chocolate Truffle Balls to students. I explain that when I was younger I would see these at my grandparents’ house during the holidays, and that you hated them when you were a kid. I want to create the expectation that the target market for these are the elderly during holidays. Note: This is not Lindt’s targeting strategy. It helps me to create the learning lesson I’m looking for by creating the opposite customer persona from the one for whom I will ask them to design. I show them this picture of my son, and tell them this is my son, so they have a visual of their intended customer. It is important to show them a picture of a new customer they can contact. If my class is during a time when my son is available (i.e., after his school), I will allow groups who ask to call my son to interview him. If my class happens when my son is in school, if groups ask to interview him, I answer questions on his behalf. I direct students they will deliver a 90 second pitch for one product they develop based on the Lindt Lindor chocolate truffle ball that appeals to my son. I tell students they cannot develop any sort of M&M type candy, as this is the easy path. Organize students into groups of 4 or 5 members. 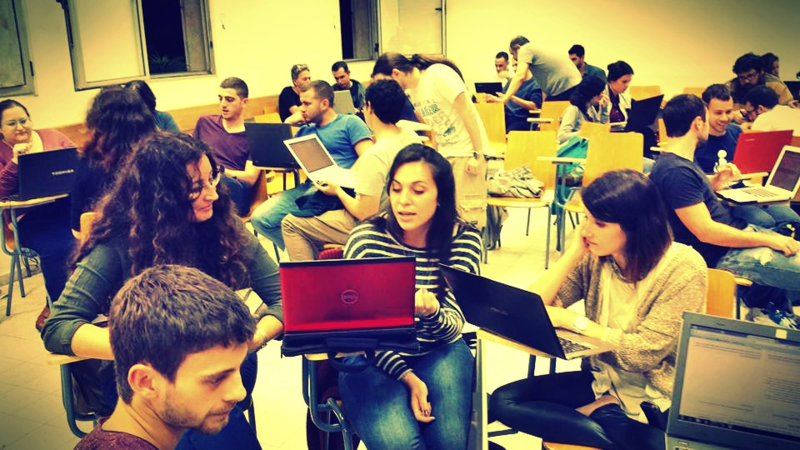 Give students 30 minutes to develop their new product offering. Students will ask many questions about what they can and cannot do. For instance, they ask if they can change the wrapper, or if the new product has to have the filling, or if they need to include multiple flavors. I will not answer most questions, as I want them operating under considerable ambiguity. I reply to all questions that their job is to create a version of the product that aligns with Lindt’s product portfolio but that is appealing to my son. During this stage, students often spend far too much time on the idea generation phase. I walk around the room, reminding them of the time left. This creates some urgency for them to move beyond idea generation and complete all aspects of the assignment. Students know they are designing a product for my son. If they ask me about my son’s preferences, I will sidestep those questions. I want students to not get information from a second-hand source, but to realize they have access to the actual customer. Some students ask to talk to my son, so I call him and let the team talk to him (if he is available). If my son is not available, I will answer questions on his behalf as honestly as possible. If my son is available to judge at the end of class, I put him in a different room during the class, so students do not know he is there. All students will easily conclude they can interview him if he is in the room during the activity. I want to make it possible, but not easy, for students to gather information directly from their intended target customer; I want them to take a risk and ask if they can call my son. Students typically figure out or guess that my son is into video games. Those who talk to him, or ask me, find out he is a big fan of playing Minecraft. Many of these teams begin designing chocolate in the shape of Minecraft items (i.e., chests, animals, Steve, etc.) These have been the most common concepts from my students. I see a wide variety of tweaks to this general strategy – some include coupon codes for extras in the game, some include colored filling. Teams who do not interview my son or I create a variety of products they think will be attractive to preteen boys. Ideas have included products themed around Fortnite or some other video game, Disney, Legos, Harry Potter, sports, emojis, etc. These are drastic failures as my son is singularly focused on gaming. Some students have younger brothers or nephews who are the same age as my son. These groups often design a solution for those boys. Some will even call and interview their relative. What they forget is that I told them the customer is my son. If his interests differ from those of their relative, they will design an ineffective product for my son. Students who effectively interview my son or I realize the product my son wants is something he can easily and cleanly eat while playing video games. Winning products usually include packages that conveniently sit beside him or in his lap during gaming and include some sort of dunking product functionality. Note: this will change drastically based on the person you choose as a new customer. Generally speaking, girls want a different product than boys, gamers want something different than athletes, etc. That is a valuable learning lesson to reiterate during debriefing. Only one group in the many semesters I have conducted this exercise asked for feedback on their prototype. Because most groups spend so long on idea generation, they do not have time for multiple prototypes. This group, however, Facetimed my son multiple times with a variety of prototypes, each time gathering valuable feedback on his wants and needs. This group won by a landslide in that class. This is a valuable learning lesson to reiterate during debriefing. If my son is available, I bring him into the room and students pitch to him. If he is not available, students pitch to me, I record pitches and let them know my son will judge pitches that evening. Each team presents their product name, slogan, description and value proposition while showing their drawing. After the pitches, if my son is in the room, he chooses the winner and explains his justification. If my son is not available, he watches the pitch recordings at night and looks at the drawings I bring home. In this case, he chooses a winner, and records a debrief video that I share with the class. This exercise forces students to reimagine an existing product instead of creating a new product. The key learning is about customer interviewing. I recommend using this exercise after students have been practicing interviewing around new ideas/products. This allows you to show them the value of interviewing in a new context, which reiterates this most important skill to entrepreneurs. What was the most difficult aspect of retooling the product? Why? Did you think about interviewing my son? Why or why not? If you thought about it, and did not interview him, why not? 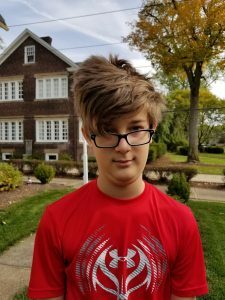 Did you think about asking my son (or I) for feedback on your prototype? Why or why not? If you thought about it, and did not ask him (or me), why not? What lessons did you learn about new product development? If you know your customer segment, interview them! Don’t guess what they want, ask them what they want. Do not get lost in idea generation. Quickly gather feedback on ideas/prototypes from your customer. Customer wants/needs and jobs-to-be-done will differ drastically between target groups. We’ve created a detailed lesson plan for the “Customer Interviewing: Valuable In Any Context” exercise to walk you, and your students, through the process, step-by-step.